This is a very simple crochet scarf pattern. However, it uses a special type of yarn, which gives it a more original, eye-catching design. Thick-and-thin yarn combines (as the name suggests) sections of bulky yarn with sections that are much thinner (DK or worsted weight). When you work it even basic stitches, the texture changes across the scarf. The result is that you get a mostly bulky-weight, cozy accessory that also has elements of a more openwork, design. In fact, it could be considered even a bit lacy, especially when blocked. You can purchase thick-and-thin yarn. You can also combine two yarn weights to get this same effect, which is what you will learn how to do in this free crochet pattern. Looking at it, you would never guess that all you'll need to know to complete it is how to make the simple single crochet stitch. This is an easy crochet pattern. In theory, this should be a beginner-level pattern because it's worked entirely in basic stitches. It's worked in rows, so you don't need to know how to work in the round or join motifs. Moreover, each row is the same length, so you don't have to know how to increase or decrease in crochet to be able to complete the scarf. That said, there's one little twist that keeps things interesting, and perhaps a bit more challenging, than a typical beginner project. 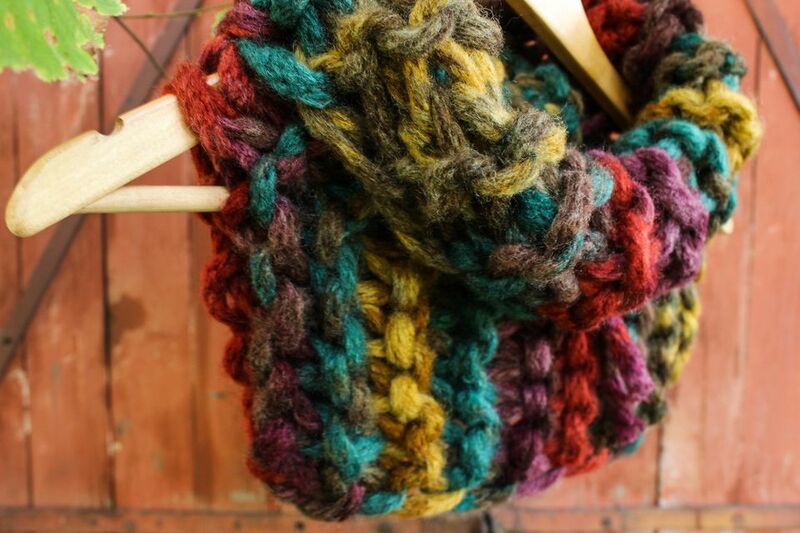 You'll be using two different thicknesses of yarn to crochet this design. The two yarn weights create an interesting visual contrast, but they also might pose a challenge for crocheters who have not yet mastered the skill of crocheting at an even tension. For that reason, I wouldn't necessarily recommend this as a first crochet project (although I do believe a determined crochet beginner with some knitting or crafting experience could successfully work this pattern). If you're a total beginner, I recommend starting with the granny square or the basic crochet scarf before tackling this project. Once you're able to consistently maintain an even tension when you crochet, then you should comfortably be able to complete this pattern. Yarn: Choose two different weights of the same yarn brand in the same color. For example, you might use Knitpicks "Swish" yarn in the "Holly Berry" color. If so, get one 137 yard/100 gram hank of the bulky yarn, and one 123 yard/ 50 gram ball of the DK weight yarn. This yarn is a nice choice because it's a soft merino yarn that is still machine washable. That said, you can combine any lightweight yarn with any bulky yarn for this project. The more similar they are in other ways (fiber and color), the more cohesive your project will look. Size P crochet hook or size needed to obtain the correct gauge. Approximately 60 inches wide by 5.25 inches high. 5 sts = about 3 inches. Your gauge may vary with tension. It's not particularly important. However, you might want to buy an extra skein of each yarn type to make sure that you have enough yarn for a scarf regardless of your tension. Otherwise the scarf's finished size may vary. Throughout this pattern, when you crochet with the bulky weight yarn, use two strands of it held together. When you use the dk yarn, use one strand alone, without doubling it. This creates a drastic difference in weight and texture between the two sections, which gives you the unique finished design. Between rows, work 1 ch st for the turning chain. This scarf may be only one color if you took the suggestion to get the same yarn in different weights. However, you do have to switch the yarns to complete the design, and the process is the same as it is for working color changes. If you don't already know how to do this, you may wish to check out the tutorial for how to change colors in crochet. Using the bulky yarn, ch 101. Row 1: sc in 2nd ch from hook and in ea ch st across. Before completing the last st in the row, change yarns so that you are using the DK weight yarn for working the next row. Row 1, and each row afterward will have a total of 100 sc sts. Rows 2 - 4: Using a loose, easy tension, sc in ea sc st across these 3 rows with the DK weight yarn. At the end of this series of 3 rows, switch back to using the bulky weight yarn. Row 5: sc in ea st across the row with the bulky weight yarn. At the end of the row, switch back to the DK weight yarn. Rows 6 - 8: Rep rows 2 - 4. Row 9: sc across entire row using bulky yarn. At the end of the row, cut yarn and end off. Flip your work over so that you can work back across the free loops in your starting chain. Attach the DK weight yarn in the corner at the beginning of the row. If you are right-handed, this will be the right-hand upper corner when the starting chain is facing up. If you are left-handed, this will be the left-hand upper corner when the starting chain is facing up. Rows 10 - 12: Rep rows 2 - 4. Weave in all loose ends. Block the scarf if desired. Blocking will "open up" the stitches; it will enhance the contrast between the thick and thin yarns and add to the lacy effect that is evident when you look at the stitches crocheted using the ​DK weight yarn.